* Do you suffer from abdominal pain, constipation, diarrhoea or bloating? * Have you been diagnosed with irritable bowel syndrome but are no nearer to finding a solution? * Since a bad dose of 'traveller's belly', have your 'insides' never been the same? * Do you suspect you may be intolerant to certain foods? 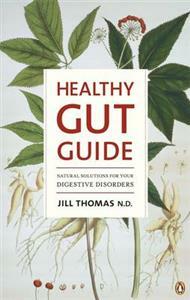 Healthy Gut Guide contains everything you need to know about healing your digestive health. Here are natural solutions to help you:* identify and treat your specific complaint* avoid common allergenic foods* discover the real cause of IBS * achieve daily bowel motions* kick-start a sluggish metabolism* eliminate bad breath* heal a peptic ulcer and ease heartburn* get the most from your supplements & herbs. With simple changes to diet and lifestyle, leading naturopath Jill Thomas shows how you can permanently resolve your digestive problems and feel vibrantly healthy again.